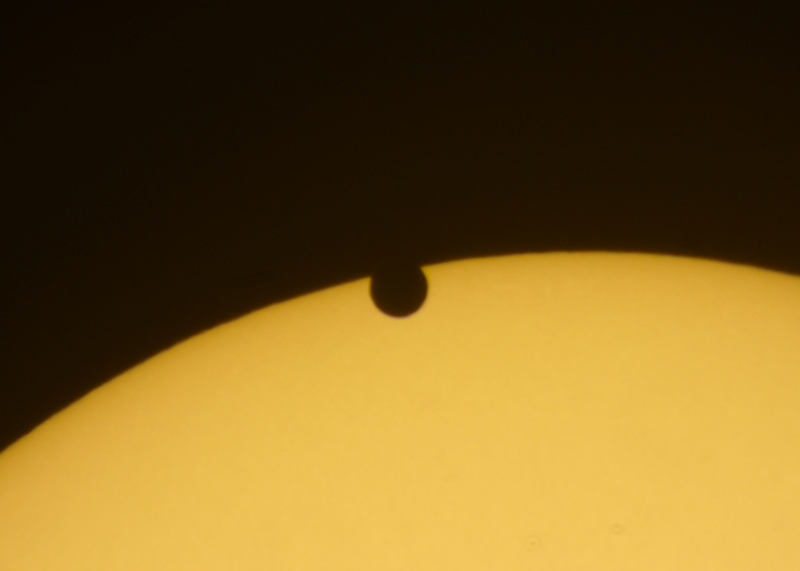 Venus begins its transit. Photo by Matt Franduto. June 5 began cloudy, even rainy in places…the worst possible conditions for a once-in-a-lifetime astronomical event: the transit of Venus! Since most recent transit took place in 2004 and the next will not be seen until the year 2117, it was today or never for everyone who had an interest. 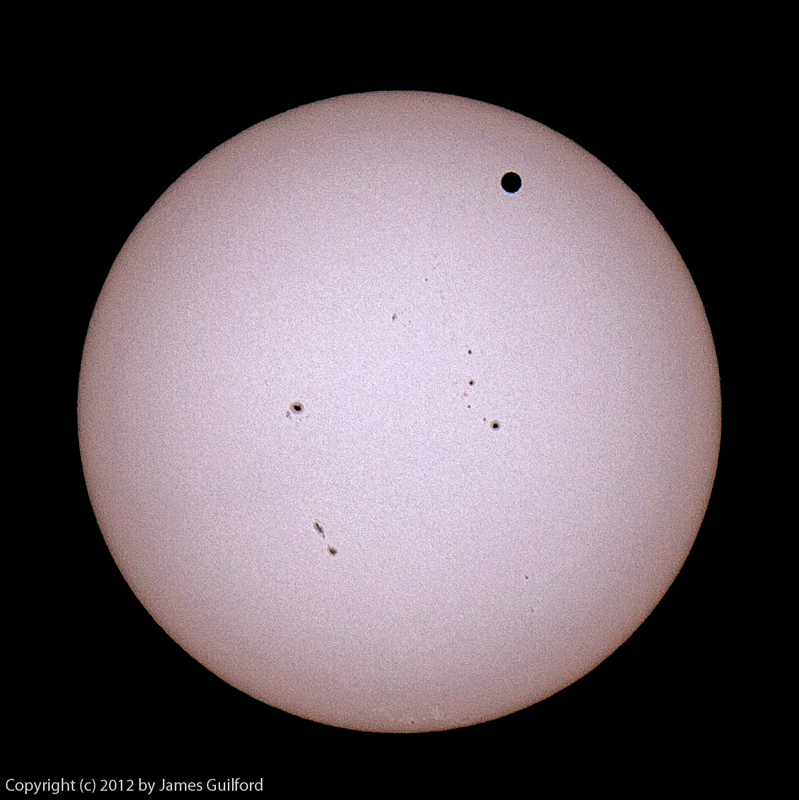 Second contact during the transit of Venus, by Joe Hamlin. As it turned out, however, barely in time for the 6:04 PM EDT start of the transit, skies began to brighten, then clear! Thousands across the North Coast region were treated to excellent views of Earth’s would-be solar system twin in silhouette against the boiling surface of our nearest star. A special celebration was staged at Edgewater Beach State Park and was the largest event of its kind in the area. Based upon controlled distribution of free solar viewer cards, event coordinator Jay Reynolds estimated as many as 8,000 people may have attended. Smaller public and private observing sessions took place around Northeastern Ohio including Black River Astronomical Society in Lorain, the Lake Erie Nature and Science Center in Bay Village, Hiram College in Hiram, and the Aurora Astronomical Society in Streetsboro. Transit of Venus 2012 with sunspots and photosphere granulation visible. Photo by James Guilford. Members of the Cuyahoga Astronomical Association, the Cleveland Astronomical Society, and others provided a good number and selection of telescopes, sharing their views of the transit with the public. Equipment ranged from the newest computerized models to beautiful, brass instruments likely a century in age — telescopes, unlike people, can survive to see more than just a couple of Venusian transits. WKYC TV-3 staffer Ryan Haidet shot and posted a good number of still photographs of the Edgewater event. To see them individually or as a slide show, Click Here! 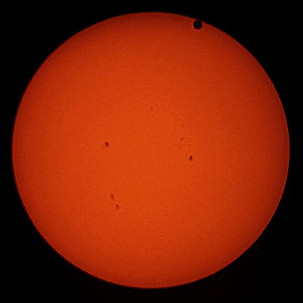 WEWS TV-5 Meteorologist Jason Nicolas wrote an article describing his impressions and how the crowd reacted to the “magical moment” in time defined by the transit of Venus. To read the article, Click Here. 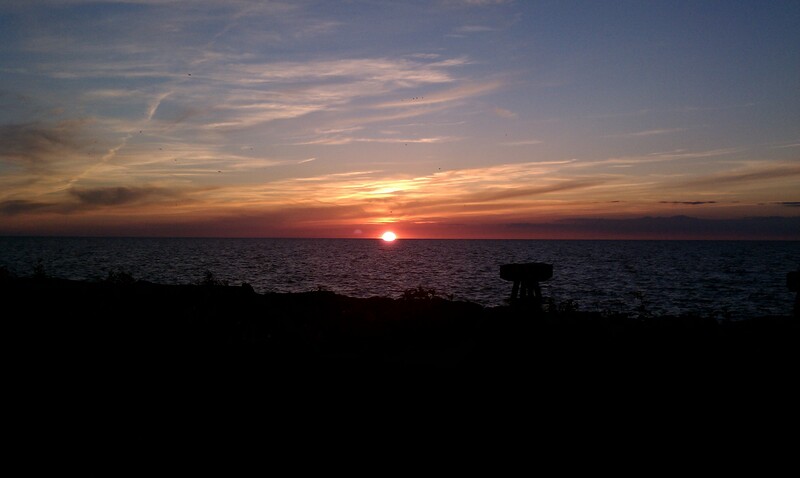 Sunset ended viewing of the transit but a star party took place after dark. Photo by Christopher Christe. This entry was posted in Uncategorized and tagged astronomy, astrophoto, Cleveland, Lake Erie, northeastern ohio, ohio, public event, transit of venus, Venus. Bookmark the permalink.